just wondering if you would add this to Dale's post. the one on the right is a really nice light yellow olive amber with an excellent strike lots of jewels. I love collecting these first variant circle cutters, very early have lots of crudity and are usually pretty affordable. Hotaling sure put out some wonderful bottles! Thanks Kelly for the pics these killer fifths I also love the early Circle Cutters! I just received a mail from Dale and Barbara Santos with a couple of pictures of an Oakland Glass Works demijohn. "This demijohn is about 15 inches in height and is light pink in color"
"They come in a darker pink color as well as amber, I am always looking for more !!!! Kind regards," Dale and Barbara Santos. 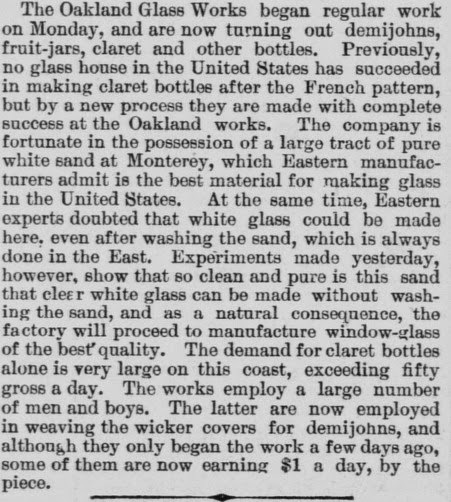 Here's an interesting article from the September 24, 1884 Daily Alta California newspaper confirming that OGW blew demijohns along with other bottles. Note that they were using sand from Monterey and also blowing fruit jars. I, personally, have never seen an OGW fruit jar. I wonder if they are as crude if the rest of the OGW bottles that I have seen? On a cold, wet and dreary day 20 plus years ago, two diggers located a privy in the back of a lot once belonging to a drug store occupied by a Dr. G.W. Brown in the early 1870s. The hole was a shallow one by this town's standards...about 7 feet deep. Along the way down, there was little sign that this particular pit would have anything interesting. There were pieces of 1870s bottles, and a few feet down, an embossed half pint amber union oval flask among the bricks, rocks and debris typically found in an outhouse. On the bottom of the hole, a square appeared and the digger in the hole mentioned that he had a square bottle in amber showing, and mentioned it was likely a Hostetters Bitters, or something similar. Upon clearing away the dirt, he was blown away at what was revealing itself...this was not an ordinary square. The bottle was still full of it's contents and was securely corked as if it had been discarded prior to anyone consuming the contents. The digger sat there for a minute in shock as he was holding a bitters bottle, but not a Hostetters. The bold embossing read " Dr. G.W. 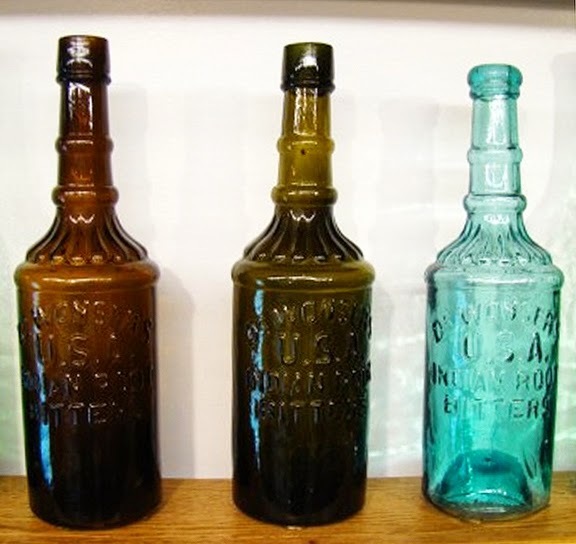 Brown's Oregon Chittum Bitters". The glass was extremely crude and the condition was pristine perfect. This bottle remains as one of the most significant discoveries in the western bitters world. For decades, I have studied ( and worn out) Wilson's book "Western Bitters". In the back section of this book is a chapter outlining the few known label only western bitters which did not come in an embossed version at that time. Since 1968 when the book was written, several of these "label only" bitters have surfaced in actual embossed bottles! The Blue Gum Bitters, Old Man's , Asher Taylor, and now the Oregon Chittum Bitters. Dr. G.W. Brown was a prominent figure in Portland's history being active in politics and running an eye infirmary in the 1860s. 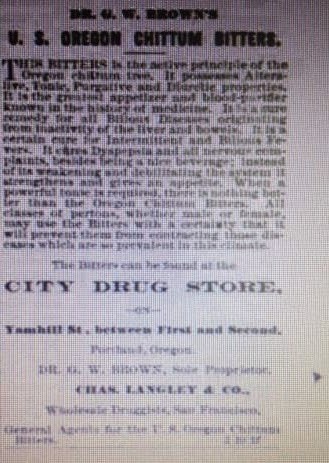 In 1871 he opened a drug store and "created" a bitters using the bark of the chittum tree which was found in abundance on the Oregon coast. On August 13th, 1872, he patented this concoction and challenged everyone to try this amazing product. Unfortunately for the good doctor, he died less than a year later. On January 10th, 1873, a group of Portland's important city leaders gathered at the Harmony Encampment No. 6 of the Red Cross of Portland, to hold a service. They unanimously adopted resolutions relating to George brown's death and divided political duties among the group due to Dr.Brown's passing. 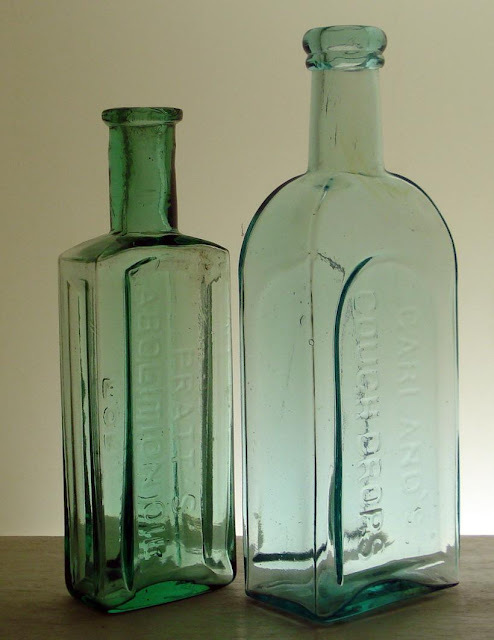 The bottle is a smaller square ( a bit larger than a pint) with a crude applied top, and those famous curved western "R"s. It is embossed on two sides, and was likely blown in 1871 or 1872. While I am sure there were more produced, this example remains as the sole example known to a very few collectors. To my knowledge, not even a shard of another specimen has been documented. This example has been in one collection ever since it was dug, and kept under wraps all these years. I have received "gentle pressure" by those who have seen it to share this great bottle with others, thus am doing so. Who knows what great new finds will occur in the future, and where they will be found? This is one aspect of our hobby which keeps us ever on the hunt for the next new discovery! I wish to thank Lou Lambert for supplying valuable information, and of course the two diggers who's identity will remain anonymous. I've got a reasonable handful of Western spices in my collection. An H.C. Hudson & Co. in green with a pouring spout molded into the lip. A green D. Ghirardelli & Co I found at a Mountain View estate sale on Pioneer Avenue many years ago. As well as this label-only example I acquired a couple-three years ago. Sorry couldn't locate my pics of the Hudson and Ghirardelli examples just now. Way too many SD cards. Ira Marden, 212 Sacramento , S. F.
Here's the early listing with the proper partnership. I found the partnership dating back into the 1860's! This is one I have never heard of... and from San Jose - Wow! Born in New York City, William H. Bovee moved after graduation to Sandusky, Ohio to work as a clerk in his uncle's boot and shoe shop. There he married Elizabeth Marshall when he was 19 years old. In the fall of 1849, the Folger family sent James and his two older brothers to the West Coast to mine for gold. The Folger family had enough money to pay for their passage to San Francisco, but was unable to provide enough money for all three boys to travel from there to the mining towns. Therefore 15-year-old James remained in San Francisco to work for his travel costs while his older brothers proceeded to the mines. Although commercially roasted coffee was available in New York shortly before the beginning of the 19th century, it was still a luxury for big-city dwellers and was entirely unknown to the population at large. As for ground coffee, it was unheard of at the wholesale level. 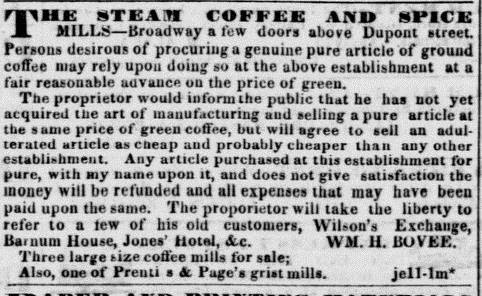 In 1850, a 27-year-old entrepreneur named William H. Bovee was looking for a carpenter to build his first mill in San Francisco, which he called The Pioneer Steam Coffee and Spice Mills. Because James was skilled in carpentry, Bovee hired him to erect the mill. 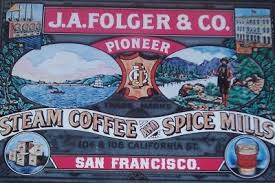 Prior to The Pioneer Steam Coffee and Spice Mills, Californians purchased green coffee beans, which they roasted and ground in their homes. Bovee saw an opportunity and inaugurated the production of coffee ready for the pot: roasted, ground, packaged in small tins, and identified by the Pioneer labels. After working at Bovee's mill for nearly a year, James had saved enough money to stake a claim and headed out to mine for gold. He agreed to carry along samples of coffee and spices, taking orders from grocery stores in the mining country until he arrived in a town called Yankee Jim's in 1851. As for William Bovee he lost his fortune in a Calaveras County mine. Bovee died of marasmus ( chronic undernourishment ) and is buried in the Mountain View Cemetery in Oakland California. The Bovee spice shaped bottle is probably the earliest embossed western distributed food bottle and a great one to add to your gold rush or western food collection! From the moment I started collecting bottles over 30 years ago, I’ve had an attraction for the shape of the “Honeywell” style spice bottles. Even though it is not considered a ‘fancy’ design, I find it uniquely appealing to the eye. Other than the common ones I’ve dug over the years, I’ve only admired them in other collections…that is, until I decided about 6 years ago to specialize in Western made bitters, sodas, meds and utilitarian bottles. Color is usually king with me, but on occasion a super crude aqua bottle might garner my attention…or even a good labeled bottle. Such is the case with these two labeled Western spices I was able to purchase at the last Downieville Show. Although the labels are partially worn, it is exciting to take a glimpse back in time and experience a visual of what one would find in the cupboards of a 1870 home here in the west. Plus, I feel it is important to document these labels, as they may turn to dust someday. The more colorful label reads: Ernest Adelsdorfer & Co/Ginger/406 & 408 Sansome/San Francisco. My very limited time doing some quick online research revealed the company was at the least doing business in the late 1870s to early 1880s manufacturing and dealing in teas, coffee, spices and yeast powder. Ernest was born in either 1853 or 1854 and lived into his 90s. 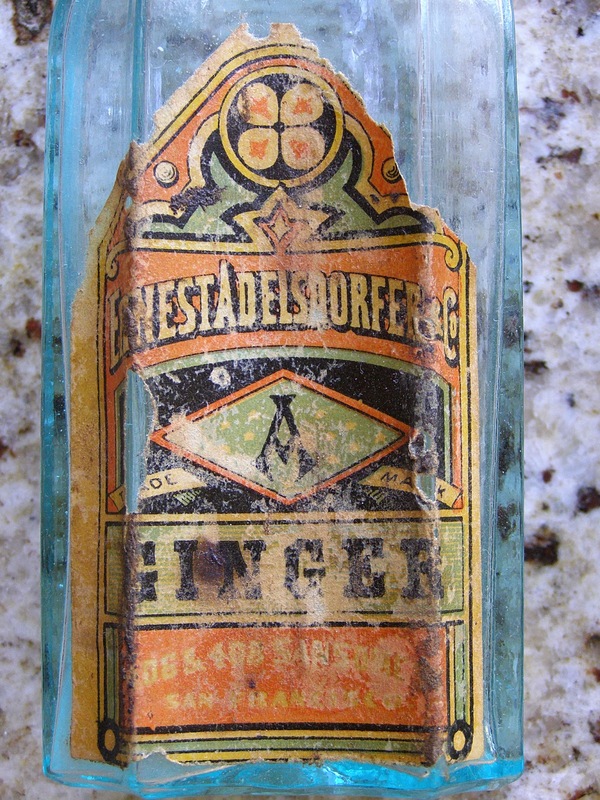 This bottle appears to be from the 1880s period. The other less colorful label reads: Steam Family/Chartres Coffee & Spice Mills/Fresh Ground/Sweet Marjoram/For/Family Use/Put Up By/Chas. Bernard/707 Sansome St/Between Pacific & Jackson Streets/San Francisco. 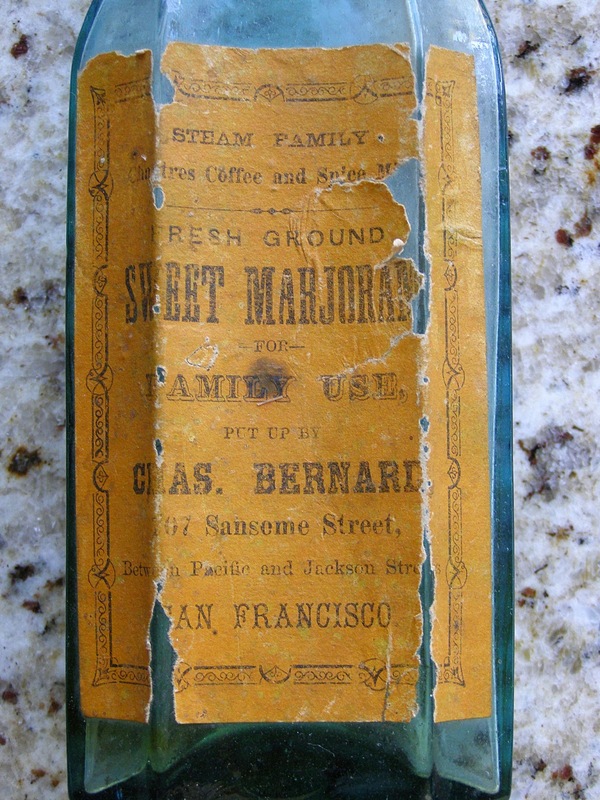 Bernard appears to have gone into business quite early in the SF area, as I find reference dating back to the late 1850s and carrying into the late 1870s. 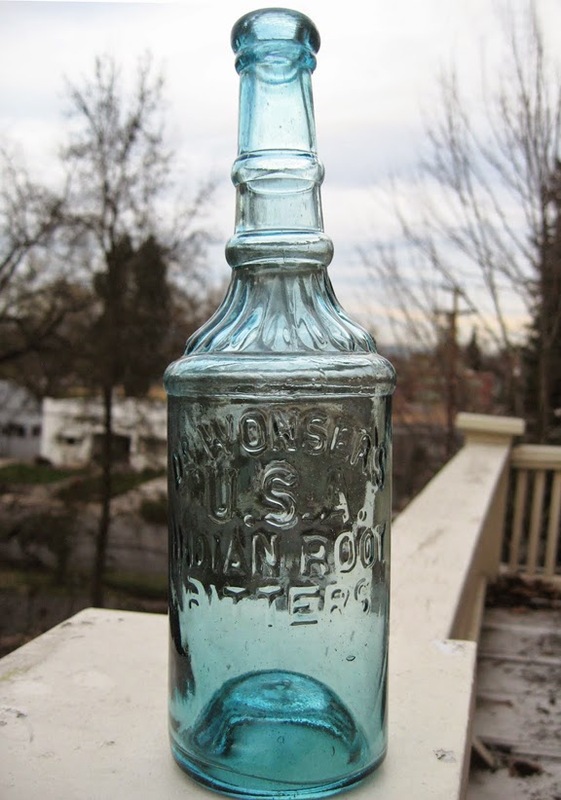 This bottle appears to be 1870s. My post is not intended to be the final word on these spice bottles and the companies listed on their labels, so please add to, or correct my limited research. This is also an attempt to incite more information to be brought forth on these and other Western spice bottles, both embossed and unembossed, that seem to be somewhat underappreciated…or at least not discussed much. Are there any written materials within our hobby on these bottles that I’m unaware of? 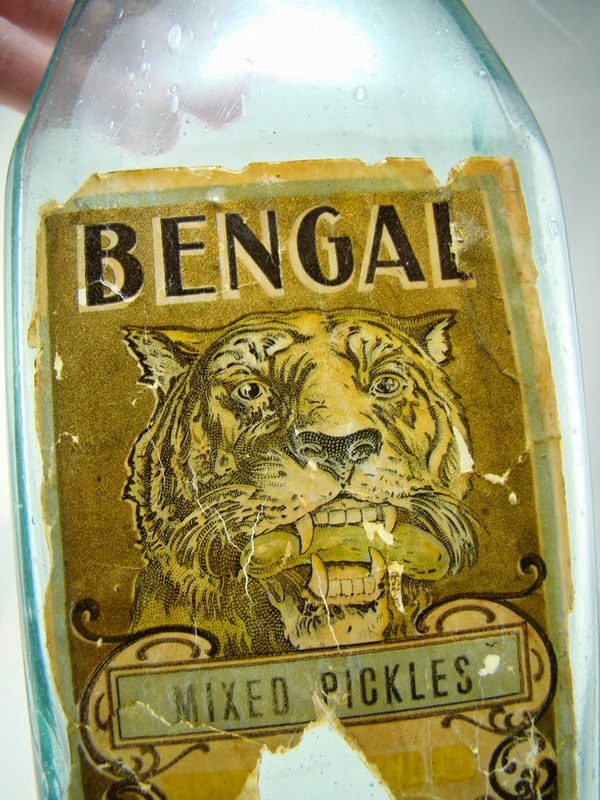 Finally, what are the thoughts out there on the origin of the spice bottles we find here with Western companies embossed on them, or those with Western labels found on them? Are most (all?) blown here in the west? Any tips on identifying those blown here, especially the slickers? 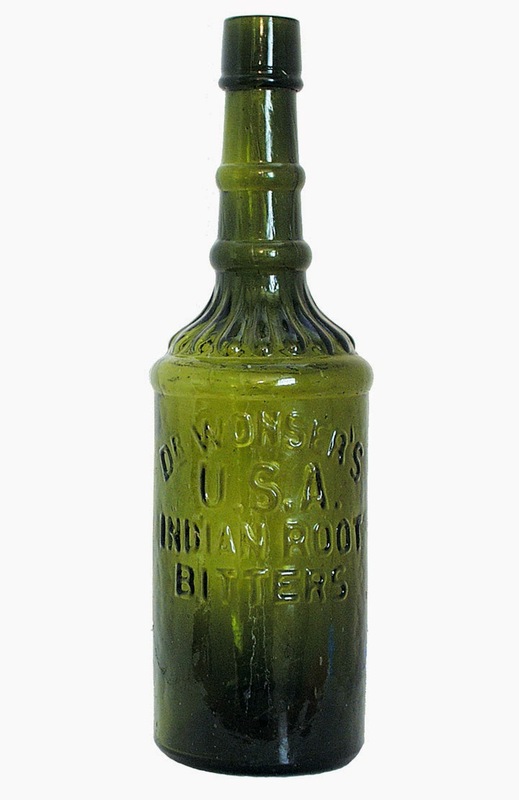 In the last few months a few of the Dr. Wonser's Indian Root Bitters bottles have changed hands and there are rumors that a recent dig has produced another example of the amber Wonser's. Maybe its time to take another look at one of the most desired and beautiful western bitters. 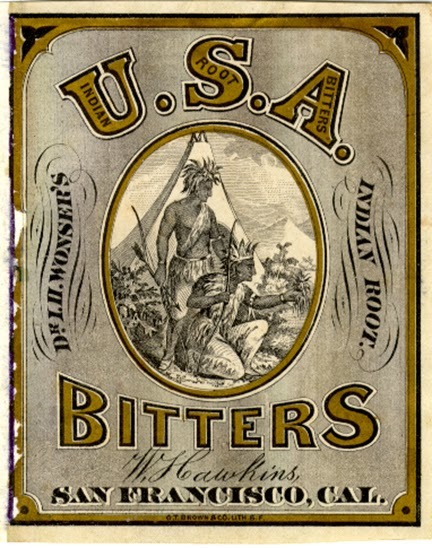 Dr. Wonser’s U. S. A. Indian Root Bitters was first advertised in The Gilroy Advocate newspaper on June 25th, 1870, the advertisement ran for 3 mos in this paper. The manufactory and depot for this product was located at 645 Third St., San Francisco.Wm. Hawkins displays seven dozen of his U. S. A. Indian Root Bitters at the San Francisco Fair on September 1st, 1870. Hawkins placed a second advertisement (in a different style format) in the San Francisco Daily Examiner newspaper on December 17th, 1870, this ad ran for 1 month. 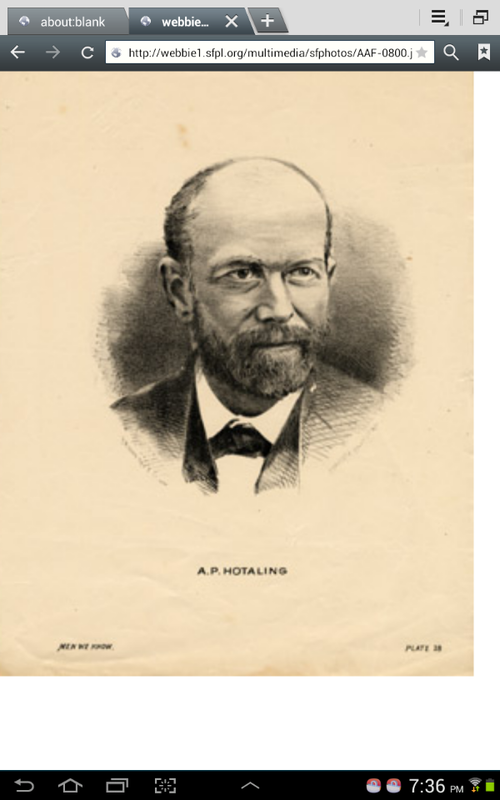 The location of his manufactory and depot was now located at 418 Sacramento St., San Francisco. W. M. Hawkins applied for the trademark name of his bitters on June 3rd, 1871, this was reported in the Sacramento Daily Union newspaper on June 5th. [see post of June 21, 2009 by Old Cutters for photocopies of the trademarked application]. “This great remedy strikes at the root of every disease, which lies in the liver and the blood. They are not like the many poisonous compounds with which the country is flooded, under the name of Bitters, which are made of refined poison and gall, and seasoned up to suit the taste. They contain no alcohol, and their effects do not die out, but on the contrary are lasting and beneficial. For Piles, Constitpation, Chronic Coughs, Dyspepsia, Fever and Ague, Kidney, all Billious and Most Chronic Diseases”. "The time frame that his product is being marketed is interesting as San Francisco Glass Works had not begun operations at their rebuilt facility until September 12th, 1870. 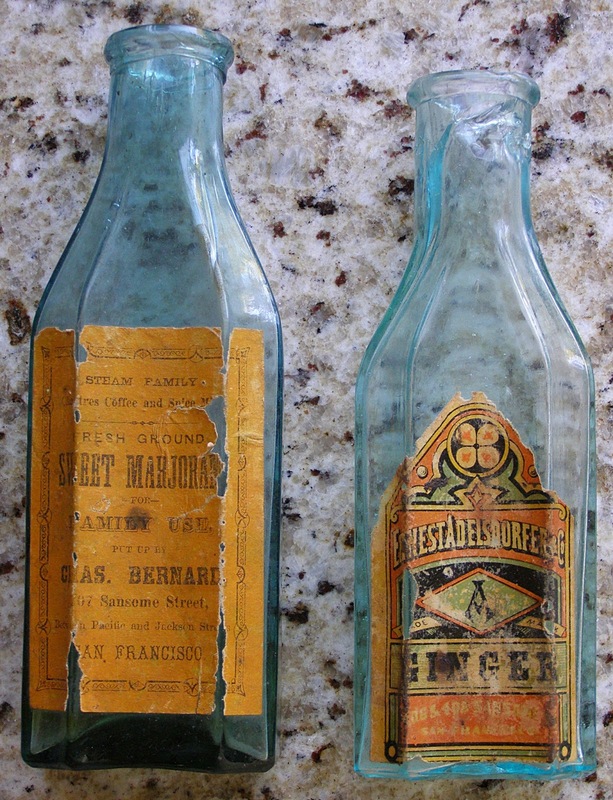 The lettering style is the same as the earlier large lettered Renz’s bitters bottle, both bottles probably made by the same pattern maker. The bottle itself is interesting in that it has been made in two variations. Both are the amber colored examples. One variant has a configured base with sharp edge and a stepped ledge going into a concave circle with small center dot. The more often seen variant has a rounded edge base with a semi-shallow kick up with center dot, the aqua examples also share this mould feature. I do not consider the different style tops to be a variant, this is just a difference of lipping tools used for the completion of the mouth". Here is a rare western sixth that has been discussed before, however the recent posts on the western sixth's prompted me to revisit this bitters. It is believed that the Dr. Miller's Ratafia was produced for only a year or so in 1878 or 79. This bottle is notorious for having manufacturing "checks" or flashes in the glass. They also are most often found with weak embossing which would indicate either some lung issues with the glass blowers, or a long enough run to wear out the sharp cut embossing in the mold ( I know you do not buy that Rick). In any case, this is a very rare western bitters with maybe 6 or 7 known in near mint to mint condition. I would guess that problem free examples with strong embossing are very few and far between. Also interesting is the range of colors these are found in...this dark chocolate, to olive and light orange to yellow amber, again indicating a fairly long run of production. So where are they? Assuming there are maybe 8-10 examples with damage, that still does not account for very many known examples. This one came from Nevada as several examples have. I would be interested in knowing what other states have produced the Ratafia in digs.I know California, but have any been found in Oregon? Guess Damiana was some sort of sexual stimulant so maybe the guys in Nevada had more issues. in a nice light color! Would you post this on the Western Bitters News site. This year the 49er club will be having our show at roseville fairgrounds December 5 and 6. 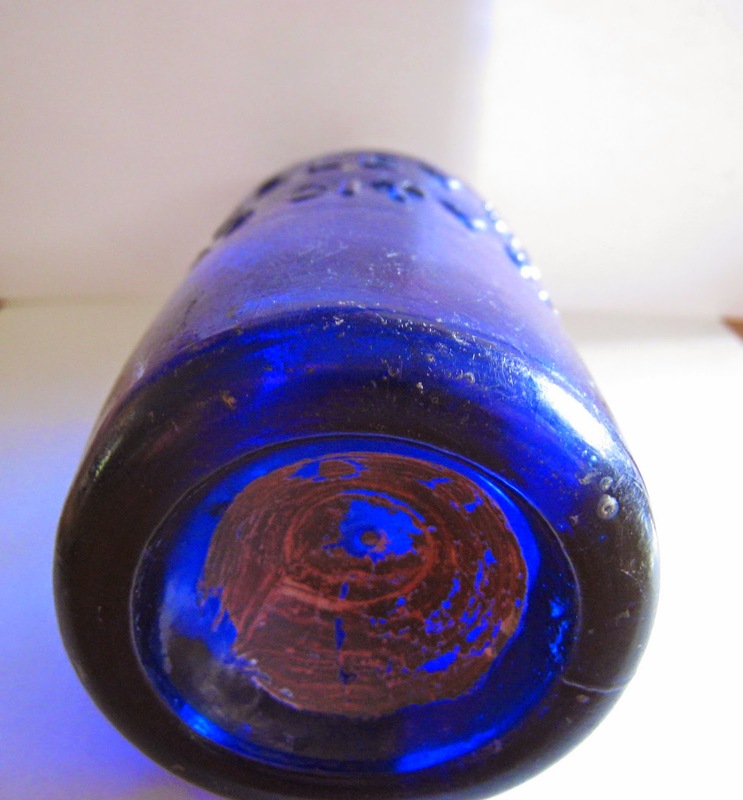 One of the displays several of us are jointly working on is of Pacific Glass works star base embossed bottles. 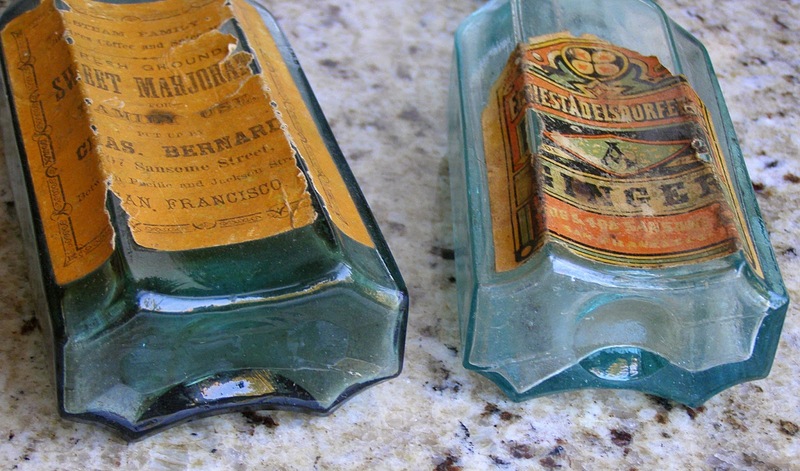 They were primarily made from 1864 to 1875 at Pacific Glass works. Some others were made at San Francisco and Pacific Glass works after they merged in 1875. We are hoping that anyone with examples of these bottles will bring them to share or display. If you wish to display in our group display space contact Max Bell at 530-823-3315. Space is limited. They are also known in shades of old amber/olive, green and even pale steel blue aqua. They are primarily found with an applied top but the some late variants come with a tooled top. The tooled top bottles are very rare and most have annealing flashes/cracks due to the poor annealing character of the glass used to make these later bottles. The wholesale liquor firm of Shea, Boqueraz & McKee were the west coast agents for the Kentucky distilled brand. They were located at the s/w corner of Front & Jackson St. in San Francisco California from 1871 to 1887. The bourbon was imported from the Kentucky distillery in barrels and bottled in S.F. 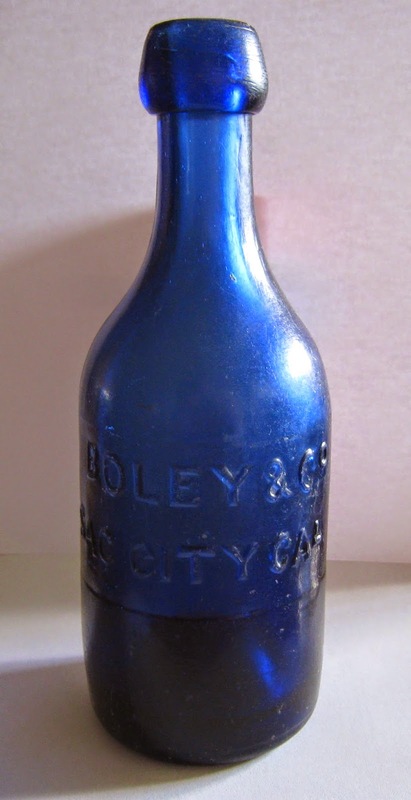 The West Coast liquor firm had a special 5th size bottle and mold made by the one of the San Francisco glass works to contain their product for the trade. Tea Kettle Bourbon was a very popular brand among miners and lumbermen here in the west. This was high quality, expensive drinking whiskey for those who could afford it. The cost for a bottle of this whiskey was equal to a days wages for the average working man. Virginia City Nevada was especially popular for this brand as most known examples have come from this area. Years ago a saloon privy on the divide between Virginia City and Gold Hill was dug that contained twenty seven whole examples and dozens of broken ones. The Tea Kettle Bourbon is one of the most popular and desirable bottles produced in the west. Most folks that collect western glass have a Tea Kettle in their collection or are looking to add one to their stable of western glass. Got your Tea Kettle yet? The first advertisement for the Garland’s Cough Drop product that I have found is in the Sacramento Daily Union in December of 1866. Milton Henry Garland advertises that he is a Wholesale Confectioner and is the manufacturer of Garland’s Renowned Cough Drops. Garland is located at 828 Market Street in San Francisco California. In this 1866 advertisement he states his cough drops “are put up in small tin boxes, two dozen in a case so they can be sent to any part of the world in good order”. Garland uses this early advertisement until sometime in late 1871 or early 1872 when he starts headlining the Cough Drops in his advertisements. By 1872 Garland advertises his cough drop product is Trade Marked, Copyrighted and Secured and is a certain relief for asthma, whooping cough and consumption, among other ailments. Garland is manufacturing the cough drops and selling them wholesale and retail while in Sacramento R.H. McDonald & Company are the General Agents for the Garland Cough Drop product. I have seen other advertisements for the Garland product with E.F Sandford, an Oakland California druggist, offering the Garland’s Cough drops for sale. It is interesting that someone would accuse Garland of using Terra Alba in the production of his cough drops. Terra Alba is finely pulverized gypsum used in making paper and paints and as a nutrient for growing yeast. Prolonged or repeated breathing of this material may result in chronic bronchitis (inflammation of the airways of the lungs). Symptoms include coughing and shortness of breath, the exact symptoms that Garland claimed his cough drops cured. The “someone’ who accused Garland of using this substance in his products was more than likely a competitor of his. After the $1000 challenge advertisement I cannot find any more information on Garland or his products. It appears that right around late 1872 or early 1873 some set of circumstances removes Garland from public exposure. Garland either goes out of business, leaves San Francisco or who knows what might have happened. The Garland Cough Drop’s bottle is around 7 inches tall with a double collar applied top and has an unusual tombstone shape with a tombstone inset panel with vertical embossing: GARLAND’S / COUGH DROPS. 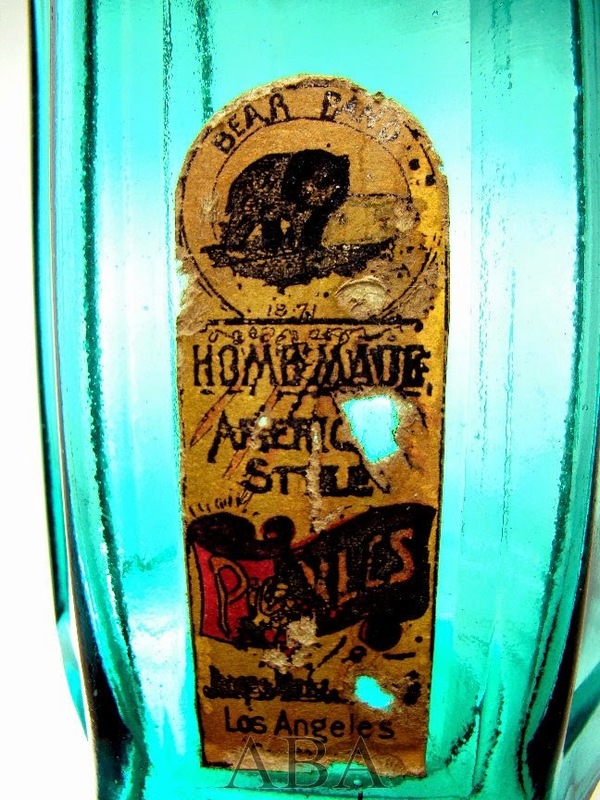 The bottle comes in shades of western aqua and is considered very rare in Wilson’s book 19th Century Medicine in Glass. 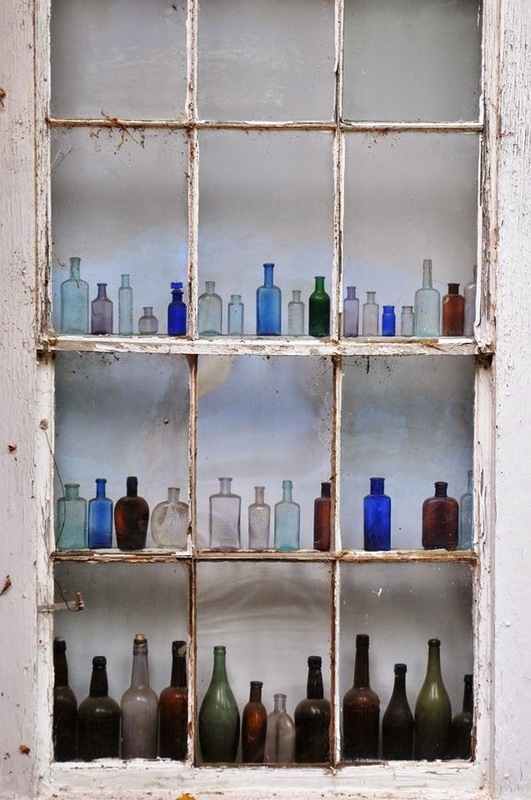 Tim Higgins’s, in his book, Early Medicine and Apothecary Bottles of the Old West considers the Garland’s as extremely rare. It is my contention that as rare as the Garland bottle is, it was probably only manufactured in the late 1872 early 1873 period, and that the accusations that Garland was using poisonous materials to manufacture the product put an end to the Garland’s Cough Drops as a marketable product. Another Beautiful Boley & Co.
WOW! Check out that iron pontil base painted Venetian red! Thanks to Cal49er for the pics!